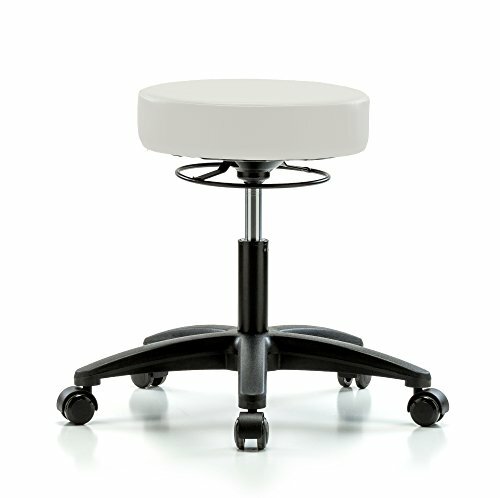 The PERCH LIFE ROLLING HEIGHT ADJUSTABLE PNEUMATIC STOOL easily fits into limited spaces and budgets! A perfect stool for a medical or dental office, salon, spa, office, or work shop, this rolling work stool features a 360° "All-Around" pneumatic stool height adjustment lever that allows you to quickly adjust the pneumatic stool height from anywhere you reach under the seat, a 21" base, and 14.75" diameter seat. Further customize per floor type with 3 caster choices: Soft Floor Casters (standard) are best for soft floors (carpet, linoleum, rugs); Chrome Hard Floor Casters (extra charge) are best for hard floors (wood, tile, ceramic); Stationary Caps are like little feet that keep the stool in place on any type of floor (no extra charge). Suitable for any office environment, work shop or for use at home. This stool upholds our exacting standards of great quality, functionality, and design. SIT SMART - WORK SMART! The LIFE ROLLING HEIGHT ADJUSTABLE PNUEMATIC STOOL by PERCH isn't just a stool, it's a tool! It's ergonomic design, world class components, and quality construction help you to work, learn, and play more effectively. ADJUSTABLE HEIGHT Perfect for use in a salon, spa, workshop, medical or dental office, this rolling stool features a 360° "All-Around" pneumatic stool height adjustment lever that allows you to quickly adjust the pneumatic stool height from anywhere you reach under the seat. 12 YEAR WARRANTY Lifetime on Cylinders! FAST & FREE shipping and returns! CUSTOMIZE 36 different seat color and caster combinations! Choose your casters according to the type of floor you have: Soft Floor Casters for carpet and linoleum; Hard Floor Casters are best for wood, tile, or ceramic floors; or if you don't want it to roll choose Stationary Caps - they'll keep your chair in place. BUILT TO LAST Designed to be used all day - every day makes this stool on wheels perfect for doctors, mechanics, estheticians, massage therapy, tattoo artists, office workers or to use in your home kitchen. The small 14.75" diameter seat with 3" of thick foam padding and a durable 5 leg 21" diameter fiberglass reinforced nylon base allows for daily usage of up to 250lbs of weight!